I have spent the past several weeks mainlining five seasons of the TV series Person of Interest. I can’t remember why I decided to watch it. Possibly I saw something on a Tumblr blog that piqued my curiosity about the characters (the final season wrapped up around the time I started watching, so social media activity might have been a bit higher). I kind of remember seeing the series advertised on free-to-air TV back when it started, but it never hit my radar until now. I have no idea why not, because I loved this from the very first episode. I’ve kind of got out of the habit of watching longer form television – 22/23 episodes in a season always seems so much of a commitment in a busy life, and too often the filler episodes needed to make up the numbers are annoying and dull. But I worked my way through four seasons of 22 or 23 episodes each (and the last season of 13) with barely a blip of boredom, despite that fact that in most of the episodes in the first seasons, the formula was pretty similar – Finch and Reese get a number, they investigate the number, they save the number or foil the number’s dastardly plan. I mean, it’s pretty straightforward, right? The thing is, the plot points are really not what matters in this show – it’s all about the characters. Initially, we are drawn into the stories of John Reese (Jim Caviezel), ex-military, ex-CIA super special agent, presumed dead, current status despondent street hobo, and Harold Finch (clearly not his real name) (played by Michael Emerson), shadowy billionaire of a hundred identities (none of which seem to actually be his) who recruits Reese to his cause – saving (or stopping) the numbers. Behind the numbers is The Machine (and if you don’t think of this entity as a character it its own right within a couple of episodes, well, just give it time…), an AI created by Harold at the behest of the government after the tragic events of 9/11. Reese and Finch both have pasts that haunt them, and these are gradually shared with us through flashbacks to years gone by. 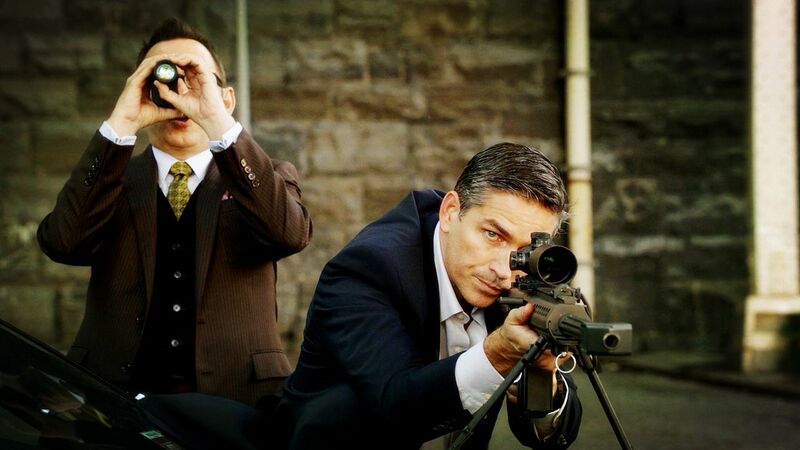 Really darn GOOD flashbacks, I have to add – Person of Interest successfully incorporates story elements with character detail in a lovely meld that advance the plot while giving us even more reasons to love our characters. While Finch and Reese get us hooked (and the genuine friendship and respect that grows between these two characters whose skills and experiences complement each other, to the point of self-sacrifice more than once, is just lovely), the reason I was totally on board for the ride is Detective Joss Carter (Taraji P Henson), who is an great character played by amazing actor and really what made this show pop for me. Her journey was what anchored me through the first few seasons, and while naturally I was delighted when other women (Root – Amy Acker (also fantastic) and Shaw – Sarah Shahi) joined the cast, Joss was always my favourite. Well, Joss and Zoe (Paige Turco), who NEVER got enough episodes! And I can’t forget Detective Fusco (Kevin Chapman), whose character arc was fabulous, and perhaps the most dramatic of all, and another favourite, mob boss Elias (who I was always going to adore, because, well, Enrico Colantoni…). One of the things I loved about the show was the number of female characters. Not only the leads and recurring players but from the very first episode, we get women in one-off roles both as perpetrator AND victims, which was exciting to see (I know, it SHOULDN’T be so exciting to have women be heroes and villains, but it is…). This continues throughout the series, and at one point, there is parity with the male and female leads, which was very cool. That said, I’m not blind to the problematic elements. I finally got around to watching the six-part TV adaptation of John Marsden’s Tomorrow, When the War Began (first screened on ABC3). The original book was published in 1993 (one of seven in the first series, followed up with the somewhat superfluous and repetitive trilogy, the Ellie Chronicles), and was previously adapted as a film (which I talked about here) in 2010 (and because the first version of the film Red Dawn came out in 1984, I can’t suggest it too was based on the book. The similarities are rather remarkable though, so possibly Marsden was inspired…). The first book (and often its immediate sequels) have been studied in Australian schools for most of the past twenty years, and are staples of library shelves, having won multiple awards both in Australia and overseas. I’ve read them all. I’ve seen the film (which I actually quite like as an updated adaptation, although I’ve not found too many who agree with me! ), and as I always thought it better suited to a TV series than a film, I was keen to see how the show looked. Second Chance – will it get one? Second Chance may be one of the most interesting shows nobody watched in the past six months. There’s very little likelihood it’s going to get any more than the (shortened) 11 episodes that have just finished airing, because no one is talking about it. The Wikipedia episode entries stopped being updated at episode five. That’s a pretty damning indictment. And yet, despite a few reservations (and let’s face it, we have those even about the very best, most popular shows), I’ve looked forward to watching it every week. It’s been engaging and action-packed and character-driven and fascinating. And it’s based on the story of Frankenstein. What’s not to like? Warning, there will be general spoilers for some aspects of the show contained below!